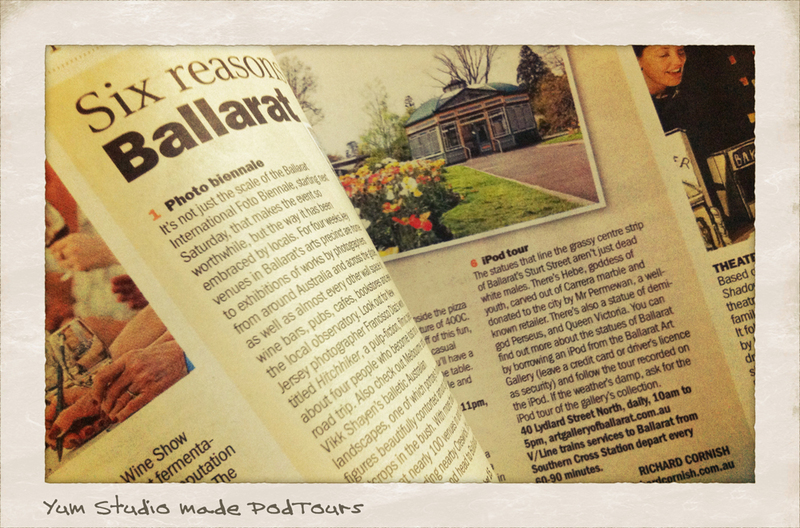 There are many reasons to visit beautiful Ballarat. Some reasons are so totally fresh, others are as old as time itself (well after the swamp was reclaimed). 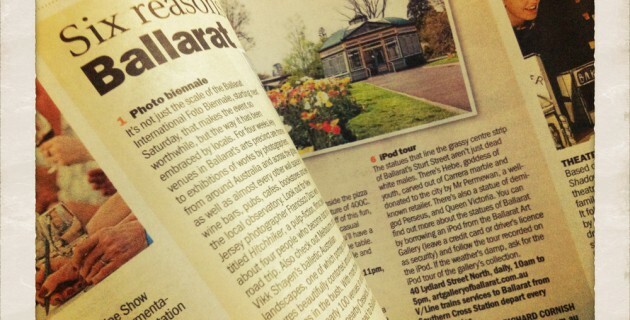 Recently The Age put together a feature that included creative media made by us here at Yum Studio as just one reason to visit. There were some other great points of interest too - all connected to Yum. You believe? We also figure we can put the best first... yeah! We are incredibly proud of these series of short films, made for the good visitors to Ratville. The Prime Ministers Avenue series of short films were recreated in the media of the day and are fabulous, even if we say so ourselves. There are also tours of the Statues of Sturt Street and ArtPod which highlights great art from the extensive collection at the Art Gallery of Ballarat. This is such a fabulous festival of all things photographic. Our intrepid leader has exhibited at this festival a number of times in challenging exhibitions that pushed boundaries of time and place (and possibly talent). Here's Semaphore at BIFB for your pleasure. And here is the fest. Opened just last year to a round of huge and applause and some relive, finally in Ratville we had a funky wine-bar that was not only fabulous, but great wines, great ambiance and a great place to be any ol' time of the day or night. We have been here more times than we care to admit, for all the fabulousness and a few gatherings about art, media and friends (what else is there?). Here they are on Medium. Have to admit we haven't been there yet, as the old pizza place on Sturt Street we have been going to since god was a lad 'Eureka Pizza & Pasta' is still standing, still fabulous, still family run. We do however SO appreciate more good foodie places n Ratville. Here is The Forge. Dry for a few years due to climate change and drought, this lake is a beautiful place to visit to walk around, have a glass of wine beside, frolic in fairyland, or wait for dark for the submarine races (bring a more than close friend). Also the suburb has been immortalized by local musos for many years. One of these is Dead Salesmen we diid a clip for. Ladies and Gents I give you Lake Wendouree. We Made it Through from Erin M McCuskey on Vimeo. Ballarat is indeed #beautiful, and #fabulous. One Response to "Six Reasons"
And just how many of these delicious pies have you guys had your fingies in??? Why would you wanna live anywhere else!